On The Red Carpet With The Cast Of Danny And The Human Zoo | Life, Sport and Diabetes - An everyday look at my life with type 1 diabetes. Last night I felt like the golden ticket winner from Willy Wonka and the Chocolate Factory, when I was lucky enough to have attended the red carpet premiere for Lenny Henry's Danny and the Human Zoo. As I won tickets from the BBC to attend Lenny's very first film that he'd written, about his life growing up as a young Jamaican teen in Dudley. Which was also the location of the red carpet event, in Dudley just outside Birmingham in the Midlands. 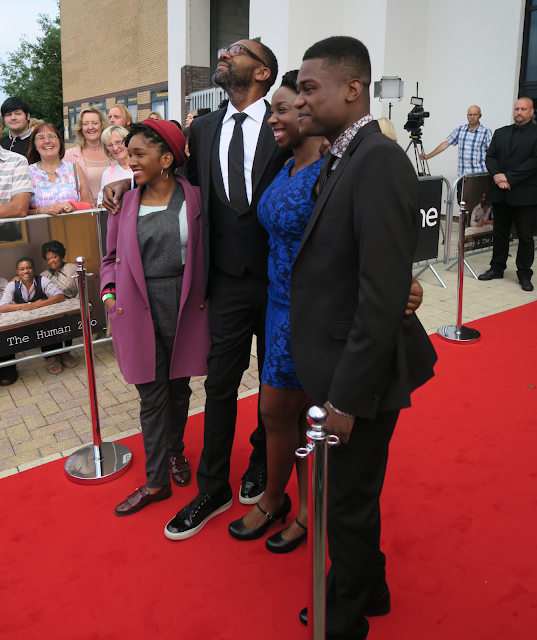 Lenny was joined on the red carpet by other members of the cast, including Kascion Franklin an up and coming actor that played a young Lenny. The Phelps twins James and Oliver, who starred in the Harry Potter films as Fred and George Weasley who had roles in the film, who we got to meet on the red carpet, along with the director Destiny Ekaragha. The event was brilliant and we got to get up close and personal with the stars before going into the cinema to see the film.